Hollister, CA –Corbin’s new Dual Saddle for Honda's CTX 1300 model is a perfect example of form and function and is available in a standard and “Close” version that provides seating closer to the bars with a slightly lower seat height. “Close” version provides a seating position approximately 2 inches further forward than Corbin’s standard model. Corbin saddles are designed to maximize comfort and usability while providing a custom look and longer riding range. Back by popular demand, Corbin now offers a LOW model dual saddle that has a seat height similar to the stock unit. rider. Even with the improved shaping, the Corbin Dual saddle still provides a clean, flowing line on the bike. 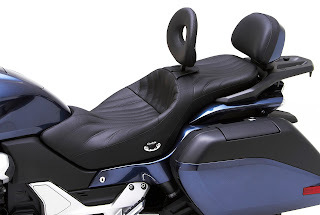 Accepts an optional removable backrest in the rider seating area to add more comfort and support. Corbin's backrest models install with a single screw and adjust easily to your riding posture. Corbin offers several models of backrests to suit your taste and the amount of support needed. 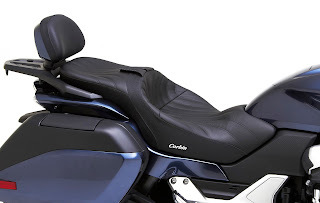 Covered using genuine leather for a perch that breathes with your body, Corbin’s quality leather will break in along with your foam for a luxurious, personalized ride. Choose from a wide range of colors and textures at no added cost. 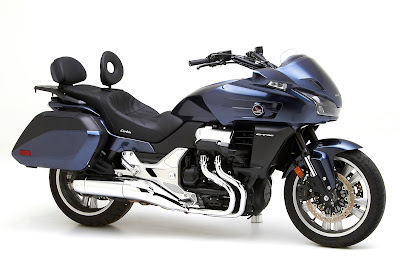 Saddle installs like stock using the Honda key lock at the rear and tongues in the front. Due to Corbin’s rigid basepan, the center hooks are not required for installation of the Corbin seat. For those interested in obtaining more information on Corbin, you can reach them at 800-538-7035 or online at www.corbin.com. Visit Corbin Headquarters at 2360 Technology Parkway, Hollister, CA. 95023 or Corbin Florida at 1433 US Highway 1, Ormond Beach, FL 32174. Hollister Event information: www.corbin.com/rally/.